In a week during which the now infamous Penny Sparrow took to social media calling black people 'monkeys', Temba Bavuma replied with his classy bat, while South Africans cheered him on. As is often the case in South Africa, sport provided us with a reminder that talent is universal. By JUDITH FEBRUARY. Sitting at Newlands on Sunday as the English made toast of South Africa’s rookie bowling attack in blistering heat, one was reminded of this. Along with Kagiso Rabada, the only other black African player in the team was the 25-year old Temba Bavuma. The next day, the gormless Kevin Pietersen took to twitter questioning Bavuma’s credentials and his place in the team. As South Africa’s bowlers were smashed around the ground, admittedly on a lifeless wicket, our collective hopes started flagging. After the decisive trouncing in Durban, even the most positive of cricket fans were feeling doubly dejected. Being surrounded by English supporters, here in their droves, did not help either. Not only had they been gifted a super-favourable exchange rate, but they were now making us look like a bunch of Sunday afternoon amateurs. Whispers around the ground also questioned Hashim Amla’s captaincy. The perfect gentleman, but without the imposing presence and brashness of his predecessor, Graeme Smith, Amla seemed to be making some curious decisions with the new ball which did not help us either. Oddly, in all of this no one really called for the head of Russell Domingo, the Proteas coach. He should not be escaping accountability for some of what has happened on the field either. In post-match conferences Amla did appear apologetic, while Domingo shrugged. And all our weaknesses were suddenly laid bare and serious questions asked about the gap between our rather weak franchise cricket and the leap to international cricket. It seemed such a typical South African scenario; gloom and doom with all of it going to hell in a hand basket. Our sport has always been something of a leitmotif for our entire psyche. After our Rugby World Cup performance last year, #Heynekefell and Bafana Bafana, well, we don’t talk about that too much. And now, cricket was the last thing standing between Zimbabwe status and us. That, along with our tumbling rand and our President. It was all falling apart. What we needed of course was for all our class batsmen to deliver. And when we thought they could not, they did. How very South African. Just as we are being written off in despair, Amla plays a courageous, gritty innings for a double century, and AB De Villiers and Faf Du Plessis come good. But despite their heroics, this match without a doubt belonged to the pint-sized Bavuma, who scored a brave and exciting 102 not-out off only 148 balls. As Bavuma raised his bat to the applause of his teammates, the South Africans in the crowd would have known precisely what this emotionally laden moment really meant. Our past is never lost on us, never far away and we all knew why former Proteas fast bowler Makhaya Ntini had his fists in the air in elation. 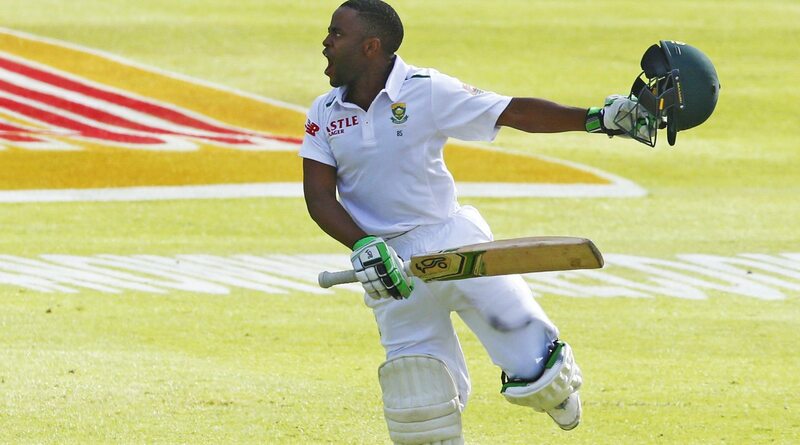 Bavuma became the first black African to score a century for South Africa. That has taken 21 years to savour. And savour it Bavuma did. Despite sledging from the frustrated English, Bavuma took it on the chin and did the job for his country. Bavuma, from Langa township, honed his skill there and later in Gauteng under the mentorship of Geoffrey Toyana. He went on to play for the Lions and become vice captain in the 2013-2014 season. He has struggled to cement his place in the Proteas side, but his century will go a long way in proving his doubters wrong. But he did more than that. He showed us what grit and determination can do and what South Africans still can do when our backs are against the wall. Amla, perhaps not our most talented cricket captain, but a player of immense talent (and integrity) showed similar resilience with De Villiers, Du Plessis and the likeable Chris Morris playing their part. Cricket is a funny old game and a draw at Newlands will be a psychological victory for the Proteas as they turn their attention to the third Test at the Wanderers. This team-in-transition will need to work on its bowling and strategy against England, but there is no reason why they cannot do so. It seems a unique South African trait to bring ourselves to the edge to discover where our true potential lies. It’s a roller-coaster ride, but the Proteas dug deep. Of course the gritty Newlands performance should not allow us to neglect the debate on what our cricketing challenges are countrywide. That honest conversation must not elude us.